There are some places so blissfully disconnected from the modern world that they seem to stand suspended in time. 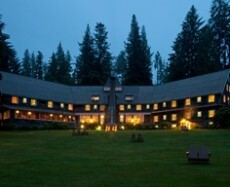 Lake Quinault Lodge is one such place – a grand and rustic lodge built in 1926 that welcomes guests with warmth, hospitality and a sincere feeling of home-away-from-home comfort. Here you can unwind in front of our majestic fireplace, curl up with a good book by the lake, paddle and fish in the afternoon sun, or venture deep into the temperate rainforest and enjoy the cool shade of the giant trees. The first step is to find the perfect room – with a lakeside view, a fireplace or perhaps in the Boathouse. In the fall of 1937, President Franklin D. Roosevelt visited during a fact-finding trip and enjoyed lunch in the later-named Roosevelt Dining Room. Nine months later, Roosevelt signed a bill creating Olympic National Park. We offer spectacular lake tours from the comfort of our captained boats, as well as many water-based activities including fishing, kayak and canoe rentals and row boat rentals. Additional onsite amenities include a heated indoor pool, sauna and game room.